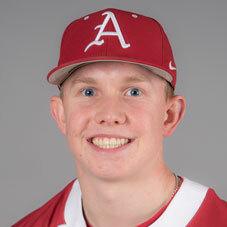 Played in and started all 69 games in the outfield … Hit .332, good for second on the team with 87 hits, 30 for extra bases, 16 doubles, 14 home runs, 58 RBIs and 145 total bases … Won SEC Freshman of the Year honors, becoming only the third Razorback to win a major SEC award (Andrew Benintendi – 2015; Nick Schmidt – 2006) … His 87 hits tied with fellow freshman Casey Martin for the Arkansas freshman single-season record … His 65 runs scored and 14 home runs led the team and were good for fourth and ninth in the SEC, respectively … The 14 home runs set an Arkansas freshman single-season record, previously set by Zack Cox (13 in 2009) … His 145 total bases were the most by any freshman in the SEC and also set an Arkansas freshman single-season record, previously set by Danny Hamblin (122 in 2004) … Hit .322 in SEC play with five home runs and 21 RBIs … Also slugged .521 and had a .375 on-base percentage against league opponents … In the NCAA Tournament, he hit .311, the third-highest average on the team with a .659 slugging percentage, three home runs and 11 RBIs … In the College World Series, he hit .250 with six hits and four RBIs … Finished the year with 24 multi-hit games and 13 multi-RBI games … Tallied his first three-hit game on Opening Day vs. Bucknell (Feb. 16), part of a 3-for-4 day with three runs scored and one double … Hit his first collegiate home run against Arizona (Feb. 21) in San Diego, California, a solo shot that was the only run of the game … Combined in series at Charlotte (March 21) and Florida (March 23-25), went 9-for-16 (.563) at the plate with six extra-base hits, three home runs and a staggering 1.313 slugging percentage, while striking out just twice … Had a season-high four RBIs against Dayton (March 1), Missouri State (April 17) and Oral Roberts (June 1) in the NCAA Fayetteville Regional … In the game against Dayton, he was just 1-for-4, but his lone hit was his first career grand slam … In the NCAA Regional opener against Oral Roberts, he went 3-for-5 with two home runs, his second multi-home run game of the year … Finished the regional 5-for-10 (.500), leading all Razorbacks with five RBIs and three walks … Established Arkansas’ freshman single-season home run record (14) with a solo shot in game two of the NCAA Fayetteville Super Regional against South Carolina (June 10) … Strung together a 14-game hitting streak from March 14 against Texas to April 4 against ULM, the longest hitting streak on the team … Hit .439 during that streak with eight multi-hit games and three games with three hits or more … Throughout the month of March, he hit .360 with six home runs and 22 RBIs … Was one of five freshmen and the only freshman in the SEC to have a .330 batting average or higher and a .550 slugging percentage or higher. Ranked No. 369 in the nation by Perfect Game and No. 26 in the state of Texas … Attended the Perfect Game South Underclass Showcase as a freshman … Named the District 3-5A Newcomer of the Year in 2015 … Part of Canyon Randall team that finished 2015 with a 33-6 record and a district championship … Was also a Third Team TSWA 5A All-State player as a sophomore … Completed a stellar junior campaign by batting .477 at the plate with 32 RBI … Named District 3-5A MVP and First Team 5A All-State player in 2016 … Member of Amarillo Globe-News 2016 Baseball Super Team … Attended the 2016 Perfect Game National Showcase … Played summer ball with D-Bat 17u Robertson and was part of the AABC Connie Mack World Series … Named to CMWS All-Tournament Team after batting .524 with five extra-base hits … Played for Cory Hamilton at Canyon Randall High School.